Don't no if this is a known tip, but just turned on developer options, reduced window, transition animation and scale to .5 what a difference. Apps open immediately. Very pleased. Sorry if you already found this out. jamesharmeling, FF22, aseeralmadi and 10 others like this. It's a known feature, but for those who don't know, thanks for the post. Now please explain to the nice people how to turn on Developer Options. jamesharmeling, dollface, phuoc and 4 others like this. Thanks for the post. Going to try this out now. do those settings stay even after dev mode is disabled? No, you need to keep the developer mode enabled. Just did this as well. Holy crap the Keyone sped up a ton! Especially scrolling thru different pages. Thanks guys! Does this change RAM usage much? So where do you find the developer options? Settings > About phone, then keep tapping the build number until the "You are now a developer!" message pops up. Then go back to the main settings screen and Developer options should be at the bottom. DolemiteDONS, hplovecraft and herr_tan like this. Thanks. Amazing. I switched the three setting to 0 to see how that works, and it is brutally fast. .5 is definitely the best setting for balance between speed and feel. thanks! just did it on my DTEK60 and the change in speed is obvious! I went back and made the three relevant controls all set at .5 and I prefer it that way. Edit a couple hours or so later: I am absolutely stunned at the difference! Unbelievable change ... apps are blazing fast now. Thanks so much for this. Last edited by stanfordprof; 06-11-17 at 01:34 PM. 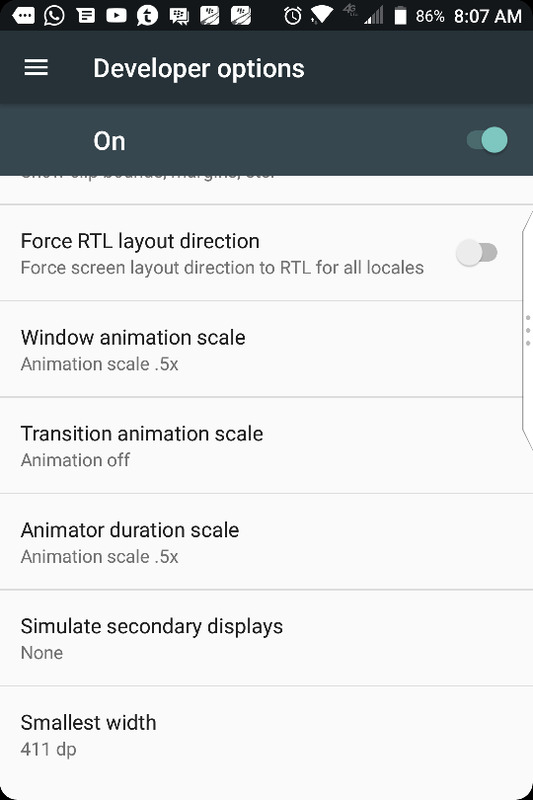 Need to keep "animator duration scale" to .5 or more or you won't see the green half moon boost mode notification. The other 2 are set to off. jamesharmeling, JeBe4 and vincentkong like this. I'm a little new to all this developer fun, so what do you mean exactly? Mine was originally set to 1 (default I guess) so why would it need to be set to 5? Not challenging, I'm genuinely curious. Sorry, I misread your post mhw100. I understand. It just cuts down on the animations. First thing I do on any Android device. Second is to clear cached data and reboot when it gets above 1GB. sales 101 and DolemiteDONS like this. First thing I do even on any PC! !